Our new Comfort Cart supports the need for comfort care for family members during an end-of-life experience. This unique cart provides the in-room necessities they need so they can spend more time with their loved one. Our Healthcare team is passionate about creating solutions that will enrich the patient/family experience. Our cart looks like wood yet is a heavy-duty composite that can be completely sanitized with a quaternary-based sanitizer or wash bay. The low maintenance, high-performance, recycled material is extremely durable to withstand frequent use. There is a retaining lip on each shelf (½" on top shelf, ¼" on bottom 2 shelves) to keep items from sliding off during transport. In the case of a spill the lip will contain any liquid to prevent potential slip-and-fall hazards. Shown on the dark grey cart for 5 or more people. Equipped with (4) 4" Dia. heavy-duty swivel casters (2 locking) which allow the cart to be easily maneuvered from set-up location to room. The non-marking, polyurethane construction provides excellent floor protection as-well-as lower noise abatement. 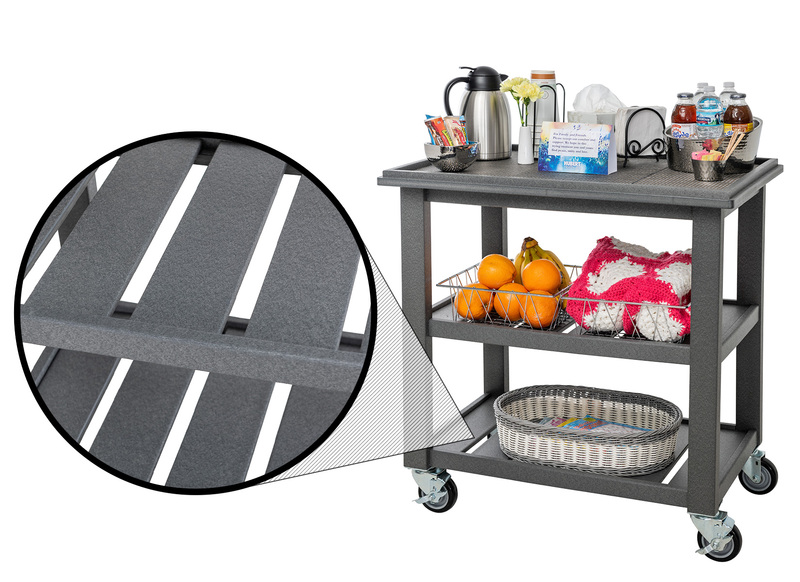 What is a Comfort Cart? Hubert Comfort Cart Kit aids patients and families with in-room necessities during an end-of-life experience. This palliative care cart allows family members to stay in the room with their loved one rather than having to seek out beverages and snacks. It's important that the cart you choose can be wiped down with a quaternary based sanitizer or washed in a wash bay. It should also be aesthetically pleasing, so use a cart that will portray a warm and homey feel. Provide a carafe or airpot for warm coffee or tea or an ice merchandiser for cold beverages and several wire or plastic wicker baskets to hold snacks, reading material and a blanket. Be sure to include a cup/lid organizer to keep disposable cups and lids in place. A vase with fresh flowers is a nice touch as well. Be certain items used on the cart in a patient's room can be easily sanitized before reusing. 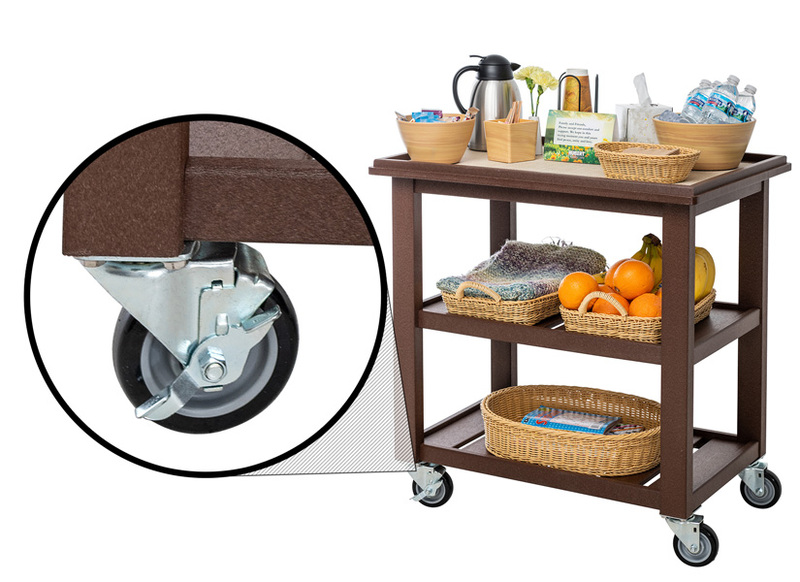 Our Comfort Cart Kit includes a heavy-duty, low-maintenance, cart that has the look of wood but is made from a composite material that can be completely sanitized. The accessories we chose match either the dark grey or warm brown cart. 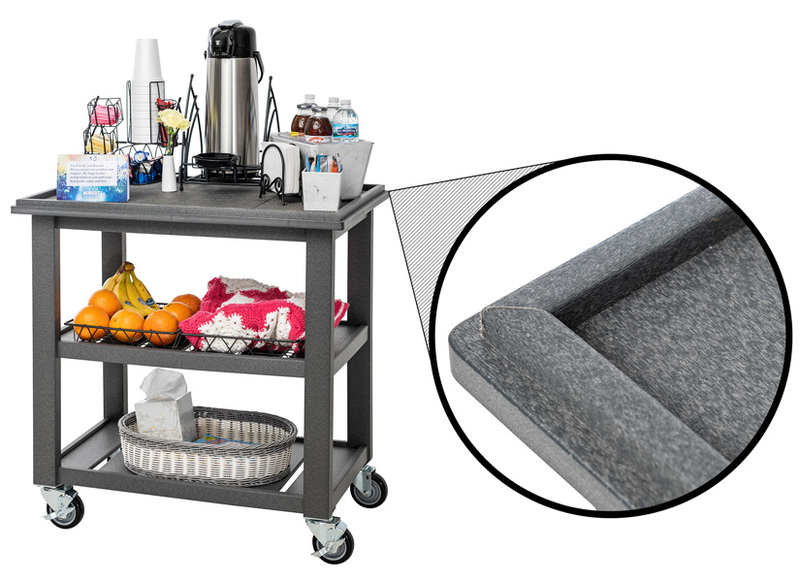 We also give you the option to choose a Comfort Cart Kit that includes everything you need to serve 1-4 visitors or 5 or more visitors. You can also order items separately so you can add or replace items as needed for your Comfort Cart Program. Our Comfort Cart Kit is perfect for medical centers, critical care units, palliative and hospice care, and skilled nursing facilities. Healthcare staff wants to help exceed the expectations of patients and visitors by providing excellent comfort care to families in times of crisis. Staff members can request a Comfort Cart through their food and nutrition department. They request a cart depending on the number of visitors that are to be served, food service will then assemble the cart with beverages and snacks and deliver it to the patient's room. Comfort Cart items normally include coffee and bottled water, granola bars, cookies and other snacks. Additional Comfort Cart ideas include; a blanket, tissues, reading material, and a journal to write down memories. A short note from the staff to the family is a nice touch as well.